Beep... beep... beep goes the alarm. Clare and I both groan at the misery of getting up so bloody early, a few sorry hours since we had finally stopped chatting and switched off the headlamps. Welcome to a new day, it is 3.45am and we have to be on the truck driving out the camp gate in fifteen minutes! Somehow we managed to roll up our bedding and dismantle the tent, shoving it into the tent locker on Jozi. We then climbed onto the truck, and carved ourselves out a small space to sleep amongst the twenty other sleep-deprived overlanders. I curled up on two the space of about one and a half seats, and although very cramped, the extremely early hour meant that it wasn't too long before I was back to sleep. The early hours passed mostly in slumber, apart from some very loud beeps from Jozi jolted us awake. The beeps and a bit of yelling from our driver and leader were aimed at a few enterprising locals, darting out into the slow-moving traffic to see whether any of the truck's spare parts weren't bolted down sufficiently. When I woke properly a few hours later, it was to find that we were clear of Dar Es Salaam, and that I had managed to keep spreading out as I slept until I had nearly four seats to sleep across. Unfortunately for my neighbours, this meant they had increasingly smaller sleeping spots. Sorry Dan! Breakfast was at the same road station we had stopped at on the way into Dar, so along with the cereal truck breakfast, we had the option to grab some more samosas. It was a relatively long drive day, but quite an interesting one as the highway we were travelling on went through the guts of Mikumi National Park. This meant that we spent several hours leaning out the side of the truck, looking for game as we worked our way south towards the Malawian border. What a way to spot game! The truck split into two groups, the left side and the right side, and we had a competition over which was the better game-viewing side. I was on the almighty right side, and I believe we definitely saw both the greatest number and the most interesting game out of our window! This included quite a few elephants, giraffes, and all sorts of antelope. Those on the left side are a bit biased and might try to tell you otherwise, but don't believe what they say! Our camp site for that night was on a working Tanzanian farm, and our last night in beautiful Tanzania. As a surprise, we had a group dinner put on for us by the farm family and workers, with scrumptious local foods such as beans, spinach and more ugali. This was also the first time I ever had an Amarula hot chocolate: and it is absolute liquid gold! I had one in the candlelight of the dinner hut while waiting for dinner to be served. I haven't looked back since that moment! A hot chocolate by itself is pretty awesome. Let's face it, anything chocolate is awesome. And you wouldn't even know that your hot chocolate hasn't yet fulfilled it's potential until you put a shot of Amarula into it. Then your eyes are opened, and a hot chocolate will never be the same again. 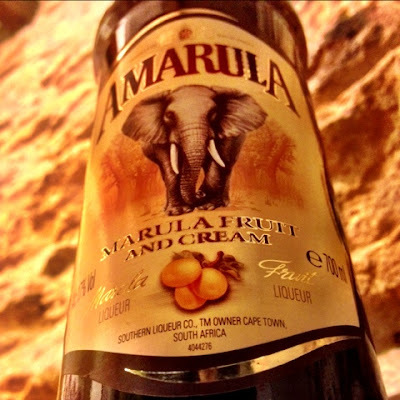 Legend has it that someone noticed that the elephants were acting drunk after eating the fruit of the Amarula tree, put two and two together and came up with this remarkable liqueur. It doesn't matter - it is enough that it exists and I can put it in my hot chocolate. Huzzah! There were two wonders that night. One - the Amarula hot chocolate - I have mentioned above. The other was the jewelled sky above us that night. Miles away from anywhere, the stars were out in full force, unhindered by the light pollution of towns and cities. I'm from a relatively small country town, and no stranger to starry nights, but I don't believe I've ever seen such a beautiful night sky. As if the animals, adventure and Amarula hot chocolates aren't enough reason to make your way to Africa, the stars out here are certainly reason enough to make the journey.